Did you ever create a gingerbread house as a kid? I remember having to find all the components in fourth grade, from graham crackers to marshmallows, that would really make mine stand out in the classroom. (It was a school assignment that we were actually graded on, can you believe it?) 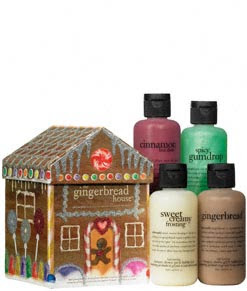 The idea of the gingerbread house has always intrigued and excited me, so when I came across Philosophy's The Gingerbread House, I just knew it had to be mine. Each of these four scents is unbelievable. I really do want all of them lined up in my shower so I can mix it up every day! Gingerbread and Sweet Creamy Frosting are both utterly scrumptious and mouthwatering, while Spicy Gumdrop and Cinnamon Hot Dots are tangy and zesty. And Philosophy just continues its trend of creating scents that just smell exactly right and real. At only $30 on philosophy.com, this is definitely a house in anyone's price range! This is so adorable for a holiday gift - I think I'm giving one to my BF's niece! too funny! i wrote about this too for the exact same reasons! I just f-ing love it! I had plans (with myself of course) to go after work and pick it up at Sephora! I can't wait to shower. Maybe it'll even motivate me to wash the tub and take a bath!